Home > Over ons > About us ???????? Koi Kichi World (KKW) was founded in 2006 by Tjaard van Balen. Koi Kichi in Japanese means koi crazy and that’s the best way to describe his passion for koi. To sell healthy koi who will develop into high quality, large koi with a long life expectancy. In order to give the koi the highest quality of care in the store, KKW uses the most modern equipment and keeps developing better ways to care for the koi. KKW even has a growing-section in the store where sold koi stay and get a special care treatment in which they grow in a short amount of time into large koi with an even better quality. KKW carries a wide variety of equipment for your pond. By focusing on innovation KKW is able to offer you products that are user friendly and reliable and at the same time will decrease the amount of energy and water you’ll need to maintain your pond. 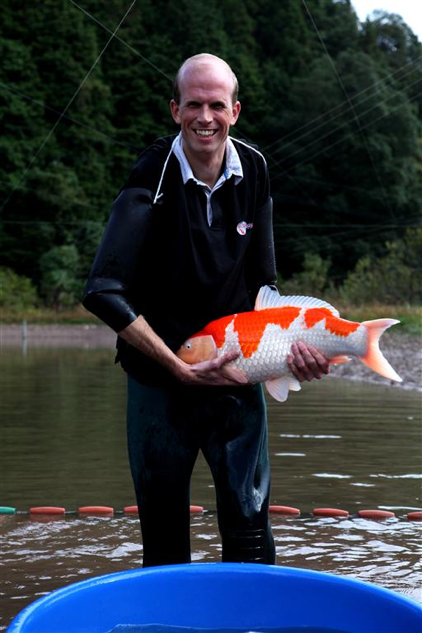 All koi sold at KKW are handpicked by Tjaard at one of the koi farms in Japan. KKW visits a lot of these farms at least twice a year in order to be able to pick the best koi for you. If you’re looking for a special sort of koi, you can always ask if Tjaard can look for one during one of his trips. It’s even possible to join him on a trip to visit the farms in Japan. It’s the trip of a lifetime for the real koi kichi! If you have questions about the koi on the website or the products sold at KKW, feel free to email or call the store. Or you can just stop by the store during opening hours. We can ship your products anywhere in the European Union. If you don’t life in the Netherlands, Belgium or Luxembourg, we will contact you to make further shipping arrangements.